Somehow it was not until my second morning that I heard it: a few blasts of a horn, then a few more, a freight train rumbling past, like something out of a country song. This is the sound of McComb. And had I been a savvier traveler, that is how I would have arrived. Twice a day, the famed City of New Orleans still slips into the original 1901 Illinois Central passenger terminal, which doubles now as the McComb City Railroad Depot Museum. 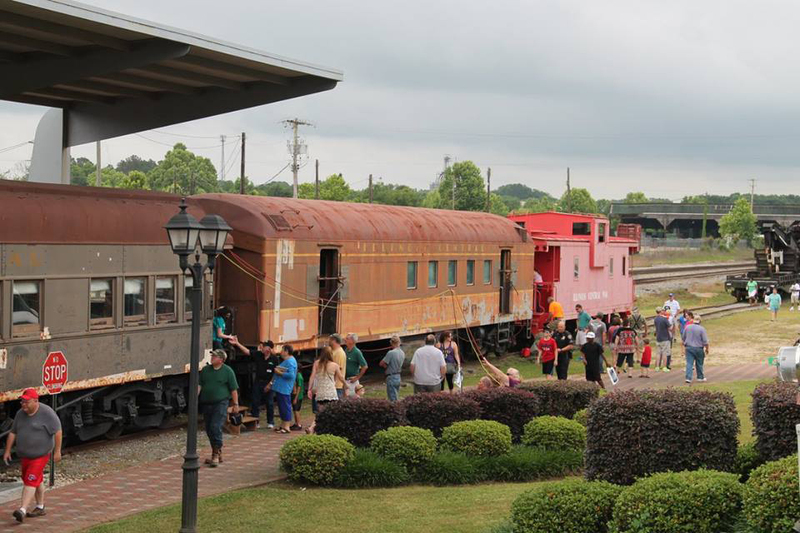 There, for 11 years, Woods has served as hostess, introducing visitors to the collection of 1,500 railroad artifacts that tell the story of this town. It all begins with “Mr. McComb,” Woods says, or Henry Simpson McComb, who seized control of a New Orleans-based railway. Wanting to move the maintenance shops away from the bustling saloons of the French Quarter, he eyed a patch of woods up across the Mississippi line. And in 1872, McComb was born. Written into the charter was a prohibition on spirits; this was to be a staid and productive town, tucked way back from city life. The woods remain (more on that in a moment) but these days, plenty of fun awaits just steps off the train. Yes, downtown McComb is hopping these days. Two doors down, contractors are putting the finishing touches on the old Palace Theater, which hosts big-name musicians as they swing through town. Nearly every month locals find an excuse to throw a giant downtown block party with music in the streets. (McComb, after all, nurtured pop stars from Bo Diddley to Britney Spears.) Even at lunchtime, if you’re lucky, you’ll hear the ringing tones of choir practice spilling out from the historic Kramer Roof building, home now to the Jubilee Center for the Performing Arts. Once you’re sated, head back to tour the Depot Museum (and don’t miss the eight rare old rail cars out back) and then shuffle just beyond downtown to shop for gifts at Debec’s/Sew Be It or local art at the Gulf South Art Gallery. Then head to The Historic Brentwood House, an elegant 1912 manor house that accommodates overnight guests. Or rent a car: there’s plentiful lodging across town, by Interstate 55, and, for adventure seekers, lovely campsites and cabins tucked into the surrounding woods. But before you finish up your downtown experience, you’ll want to dine again at The Caboose, an elegant steakhouse housed in a century-old car dealership. Tomorrow, whatever your style, you’ll need that car. Shoppers can continue their perusal (try Friendgirl Things and District 51 for stylish clothes). Foodies might head to Buddy’s for one of the state’s best burgers or some hot tamales. And the historically minded will want to follow the well-documented Civil Rights Driving Tour, which illuminates the city’s role as one of the nation’s key arenas in the struggle for civil rights. Adventurers, meanwhile, will want to get out beyond town—maybe stopping first at the McComb Tackle Box—to enjoy the woods and waters of these rolling hills. Such quiet spots were, even before the railroad, the original attraction of this region, which was first populated by woodsmen living in small settlements along its creeks. This is, after all, one of the last stretches of solid land before the continent gives way to the muck of swamp; the land crinkles into pretty rivers and creeks, all pushing their way south. Just don’t laugh at the cartoonish alligators on the park’s warning signs. “It’s the real deal,” Busby says. He estimates there are more than 50 gators in the park—along with turkey and deer and bald eagles. “We should’ve made it more menacing. Show some teeth or something.” Busby says he once caught an 11-footer, though he guesses a foot of tail was missing, chomped off by another in a fight. I’m relieved to learn, though, that in more than two decades Busby has only seen intraspecies peace. However you spend your days in town, there’s one last lunch you’ll want before you catch the train out. But be sure to save room. The Dinner Bell is the last “round table” restaurant left in Mississippi, a holdover from boarding house days: diners all sit together, sharing platters of soul food that spin around a lazy Susan. Fried chicken and stewed squash and speckled butter beans—oh my. I fill my plate, but before I’m done, three new platters appear across the table. How in the world will I eat it all? Not surprisingly, the restaurant bustles with tourists all week. But on Sundays you’ll sit alongside a local, after-church crowd, including, potentially, McComb Mayor Whitney Rawlings—though, given the temptation here to bust a gut, he tries to limit visits to once a quarter. Rawlings recommends the fried eggplant, by the way—the house specialty. But don’t bother asking which dessert you should choose. I tried. So I did. A dangerous move: I have to stay awake so I can stumble back to my car and drive back out of town. But you can learn from my mistake. Just roll your way back the few blocks to downtown. You’ll have plenty of time to catch the 3:32 northbound train, on which you can sit and nap away your lunch, listening to the not-so-lonesome whistle of the train chugging you back home.